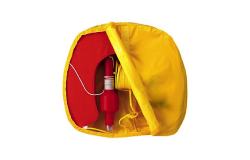 The life raft ISO RAFT RACING has a compact size, it is lightweight and very easy to store. Due to the lightweight material is ideal for boats and Yahcts that looking to save space and weight. Available in sizes for 4-12 people, packed either in a canister or in a waterproof suitcase. The LALIZAS ISO RAFT RACING is automatically inflated by a 12-metre painter line and its inflation system, provides enough gas to inflate all the buoyancy chambers. Each chamber is capable of fully supporting the raft with its maximum number of occupants. The ISO RAFT RACING is manufactured and tested according to ISO 9650-1 & ISO 9650-3 standrds as last amended for Safety and offers highly visible, stable sheltered conditions for the occupants. 6. Fully closeable entrance flap. The 10 to 12 person versions also include an additional entrance. integrity with proven liferaft design. The LALIZAS ISO RAFT is automatically inflated by a 12-meter painter line and its inflation system provides enough gas to inflate all the buoyancy chambers. The main body of the liferaft consists of two buoyant chambers inflated through a non return valve ensuring the flotation of the liferaft.